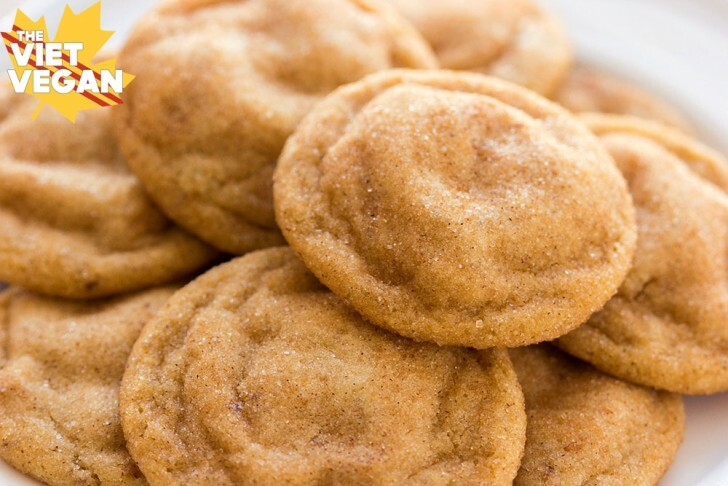 but these are epic, chewy, vegan snickerdoodles. So I totally meant to post this last Friday, but things kept coming up and I had to put writing this post on hold. Mind you, I had the photos and recipe done since November, I just couldn’t think of anything to write, so instead of writing a bunch of nonsense and just putting this out here for the sake of having it online, I decided to wait until I had a moment to take a breath, think, and write. Christmas time is always a time of reflection—frankly this entire year has been a year of reflection for me. Last year around this time, I was the saddest I’ve ever been. My eczema was the worst it had ever been, my long term relationship was at its rockiest, and I felt scared and vulnerable that I was losing grasp of the future I thought I had. If you had told me that I’d be where I am today with Burrito Boy; being this happy and healthy, I wouldn’t have believed you. Not in a million years. Over the past year, I’ve learned that I don’t need to sacrifice pieces of myself for happiness; I don’t need to become a contorted version of myself to bring out the partner I need; while it’s always good for me to be independent, it’s good for me to lean on someone else for a change; I can’t always be rational, sometimes it’s okay for my emotions to take over; not everything is my fault, not everything is my responsibility, and most importantly; I am worthy of someone who accepts me for who I am in every facet. I am very happy with the way my year turned out, despite all the drama and tears, everything is finally coming together. Spending time with Burrito Boy’s family and my family for Christmas has been really interesting and fun. New traditions, being included in typically not vegan-friendly circumstances, and just spending time watching The Office or working while BB plays Call of Duty has been really nice. Our Christmas traditions so far have been to do our Christmas shopping together, marathon Harry Potter, drink lots of cider, and eat copious amounts of stuffing. Everyone knows the best part of Christmas dinner is stuffing. And gravy. Stuffing, mashed potatoes, and gravy. Yup. That’s Christmas. Actually there are plenty of treats that I associate with Christmas: caramel popcorn, fudge, peppermint bark, and snickerdoodles. 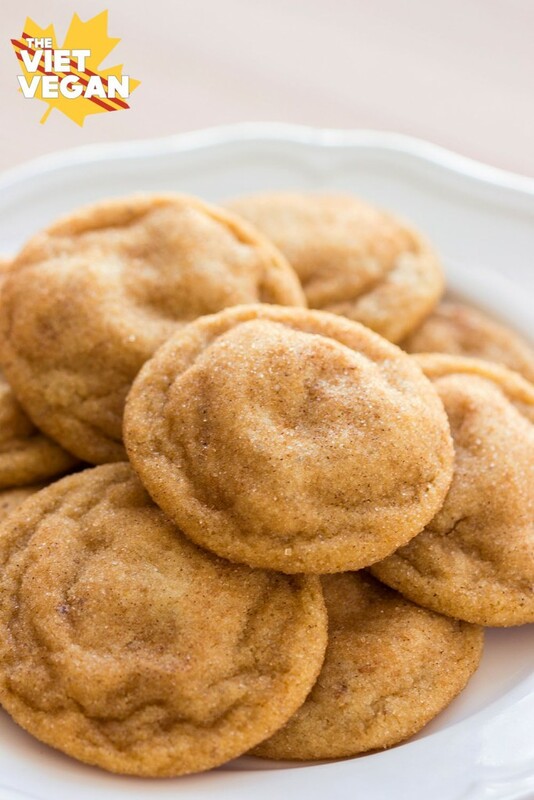 Snickerdoodles are magical: cinnamon-sugar coated, soft vanilla cookies that are perfect alongside a glass of soy milk, a mug of hot chocolate, or my favourite, a steaming cup of spiced apple cider. I made these for the Great Food Blogger Cookie Swap and sent it off to various bloggers across Canada. The last batch of them I saved for me and BB, and they barely lasted the weekend. Hope everyone is having a safe and happy holiday! In a small bowl, combine flax meal and warm water to create the flax egg. Let sit for about 10 minutes, stirring a few times in between. Leave your butter on the counter for about 30 minutes to let the chill come off from the fridge. In a large mixing bowl using a beater or stand mixer, cream butter with white sugar and brown sugar. Add flax egg and vanilla extract and beat until combined. Sift in flour, baking powder, baking soda, and salt. In another shallow bowl, stir together white sugar and cinnamon to make cinnamon sugar coating. 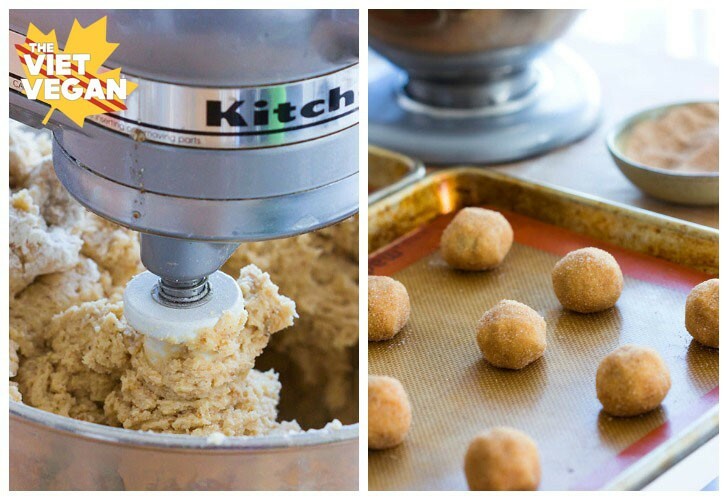 Roll into 1-inch balls (I use a 1 1/2 tbsp cookie scoop to divide them evenly) and roll in cinnamon sugar. Place on a lined, heavy-bottomed baking sheet and bake for 11 minutes, until cookies are puffy and edges are just barely golden brown. Remove pan from oven and let cool on a wire rack for a minute or two before removing the cookies and allowing to cool on the wire rack. The best cookie that I've had in a long time! Loved these cookies! So easy and they came out puffy, perfectly circular, and with just the right amount of sweetness. Will be making again soon! Would coconut oil work in place of the vegan butter? I haven't tried it, but perhaps? They might be a bit flatter though. I did half vegan butter/ half coconut and they were pretty good. Not as fluffy, but still bombbb. I have now made these twice (2 days in a row they are so good) and found if you use really light flour mixed in with the all purpose flour they are like clouds! :) and thanks for this recipe it's great! Should you store left over dough in the fridge or freezer? I just tried these and they're great!! The best vegan cookies I've ever made. The taste and consistency are perfect. Nice recipe! But be careful labeling vegan. Regular white sugar and brown sugar are not vegan as they are filtered with bone char. Hi Rae! Where I live in Canada, the majority of sugar processing plants are vegan-friendly (notably Redpath Sugar and Lantic Sugar, the two major sugar suppliers in Canada). Not true... only if it's not organic is it filtered with bone char. Organic sugar is not. Thank you! These were so good. I bought a vegan snicker-doodle at the organic store near me and it was sooooo good, but also like $3! These were just as good if not better :) Plus I like that all the ingredients were pretty standard kitchen ingredients. Do you have the nutritional info? Thanks!! These.Are.Ahhhhhmazing!!! Thank you so much! You can totally use the Earth Balance in tubs too! They are a little poofier with the EB in tubs vs the sticks. These are incredible! Don't make the mistake I made of sifting the flour to measure it- you will find you will need to add more flour at the end as the batter will be too runny to roll. They still turned out some of the best cookies I've ever made, but it was just an added, unnecessary step. Great recipe!!! OMG! Epic is Right!!! Out of the oven to die for! The carmelized sugars tell it all! The YES! teens will love it!! Thank you!